The Centerville Historical Museum, founded in 1952, is dedicated to preserving and sharing the history of Centerville and Cape Cod. The web server used by Centervillehistoricalmuseum.org is located in Scottsdale, USA and is run by GoDaddy.com, LLC. There are many websites run by this web server. The operator uses this server for many hosting clients. In total there are at least 791 websites on this server. The language of these websites is mostly english. 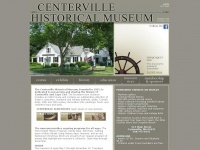 The Centervillehistoricalmuseum.org websites were developed using the programming language ASP.NET and served by a Microsoft-IIS server. HTML 4.01 Strict is used as markup language on the webpages. Due to the use of frames and framesets the visibility in search engine results may be affected negatively. The website does not specify details about the inclusion of its content in search engines. For this reason the content will be included by search engines.